Trillium in the spring. If you don't know what image that brings to mind then you must visit Northern Michigan in the spring. 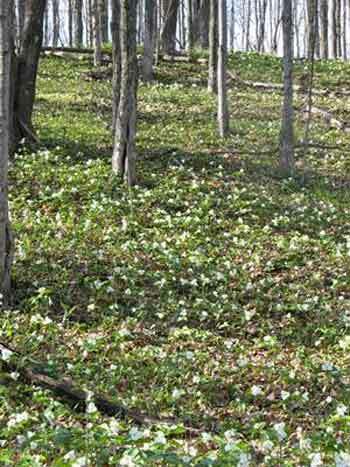 Trillium are wild, protected flowers that literally cover the forest floor with their delicate orchid-like blossoms. Stunning is the only way to describe it. Acres and acres of Northern Michigan are abloom with trillium during May and the sight is so incredible that drivers often pull their cars to the side of the road to take in the beauty. 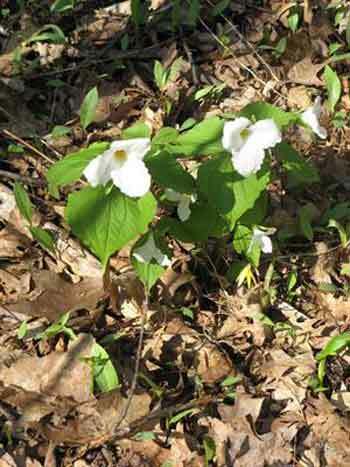 Spring is a glorious season in Northern Michigan and when the trillium begin to pop up in the woods, it is official: spring is here. There is so much to do in Northern Michigan in the spring. While the water of Lake Michigan is still chilly, the waters of the inland lakes warm quicker and make perfect destinations for kayaking, fishing, sailing, and boating. Once the snow is gone, cyclists can't wait to dust off the bike and take to the many trails or Little Traverse Wheelway which runs between Charlevoix and Petoskey. Hike the many wooded trails in Northern Michigan such as the North Country Trail. As soon as the golf courses begin to "green up," golfers can't wait to try their clubs out after a long winter. Early season golfing in the North Country is delightful and the number of golf courses here gives you a new one to try daily. And don't forget morels! These delectable mushrooms appear like magic in the woods of Northern Michigan and morel hunters fight for bragging rights as to who brings home the biggest haul. The morels are so special in Northern Michigan that Boyne City even hosts a Morel Festival. For those lucky enough to be a "local" and here through the winter months, it is when the trillium begin to pop up in the woods that gives the signal that spring has arrived. The Northern Michigan woods covered with the gorgeous flower is a sight to behold and one that says spring is here and summer is on its way.